This four day event is hosted by the European Aerospace & Defence Industries Association (ASD) in partnership with the Aerospace Industries Association (AIA) and the Air Transport Association (ATA). A mix of tutorials, product demonstrations and keynote speeches from senior industry figures, will bring together some 300 aerospace & defence professionals as they share experiences with regard to the development of international specifications. The specifications seek, in essence, to promote interoperability of information processes; reducing life cycle costs and enabling improved availability of complex systems. The ticket includes access to all sessions and workshops, refreshments and lunch, as well as access to the Drinks Reception and off-site Dinner taking place at the RAF Museum Hendon. This is a reduced registration fee for official speakers only. The ticket includes conference refreshments and lunch as well as access to the Drinks Reception and Dinner. This is a 1-day pass to the ILS-Specification day taking place on Thursday 17 October only. This ticket includes conference refreshments and lunch on Thursday only. This ticket is for accompanying guests that might wish to attend the Drinks Reception and off-site dinner only. If you wish to purchase a table top package, please follow the link here. Your registration details for the S1000D User Forum will be managed by the Air Transport Association (ATA), on behalf of the three organising partner organisations, the ATA, the Aerospace & Defence Industries Association of Europe (ASD) and the Aerospace Industries Association (AIA). Hence, ATA will be responsible for sending all public communiques to the participants list on behalf of the organising body ADS. 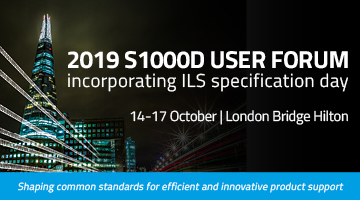 By registering for this event you are agreeing to your contact details being added to the master S1000D mailing list; noting of course that your details will not be forwarded to any third-party organisations. Your cooperation is appreciated.